Our Kultarinne facilities are two-floor apartments in Alpine-style houses, located on Ratsastajankuja right under the main slope. The larger A building is closer to Hissitie and the B building is right next to it. Car parking areas are located near the houses. Semi-detached Levikaira kelo log houses 1–6 are located in Eturakka, houses 7–8 in Viprakka and 9–14 in Martinmutka. The distance to pistes is 400–600 metres and to cross-country skiing tracks 100–300 metres. Semi-detached Levikaira log houses 17–20 are located in Nuottirakka. The distance to cross-country skiing tracks and snowmobile tracks is 100–200 metres and to the nearest piste less than one kilometre. Within the Levi area, there are great routes and tracks that are well maintained and offer various opportunities for exercising and enjoying the nature. Services are centred around the heart of the fell village, near the Levi Front piste. 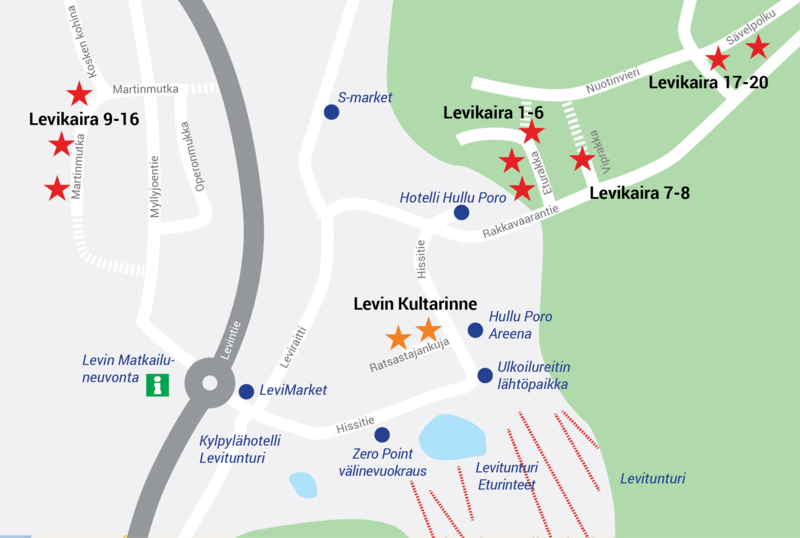 Levi Centre : See the Levi Centre area and find the most important locations on the map. Levi fell village map: See the entire fell area on our extensive village map. Levi piste map: At Levi, there are 27 lifts and 43 slopes available. See the piste map and you will know where to ski. Cross-country skiing tracks: There are 230 kilometres of tracks waiting for you at Levi. Check out the tracks and track cafés on the map. Levi snowmobile tracks: At Levi, you will find 886 kilometres of snowmobile tracks in the amazing fell scenery. Kittilä snowmobile tracks – info: Snowmobile tracks of the entire Kittilä area are shown on the map. Winter walking trail: In the winter, you can go walking on our maintained trails. Hiking tracks: Explore the fantastic fell scenery on foot! Our well-maintained tracks are suitable for everyone, and there is a track called Huippupolku for the physically challenged. Choose a track that suits your condition or challenge yourself! Is Levi a new resort for you? 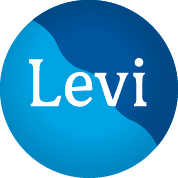 Here you can find out more about Levi and all that it offers!